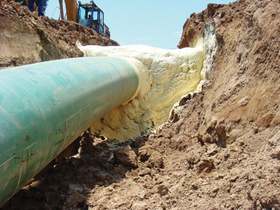 NCFI's TerraThane geotechnical polyurethane foam is used as a pipeline pad or trench breaker. It replaces the old method of using sandbags, which over time are subject to erosion. TerraThane is also used to raise and level concrete and fill the void caused by erosion. MOUNT AIRY, N.C.—It's difficult to create a company and build it from the ground up. NCFI Polyurethanes did it the best way, with innovation, ingenuity and a solid, experienced work force. A manufacturer of flexible and rigid polyurethane foam, it has bucked the trends and set its own course to achieve consistent growth since it was formed in North Carolina in 1964. It took a noted chemist and pioneer in the urethane industry who worked on the Manhattan Project and a Charlotte, N.C.-based specialty cotton textiles and fiber cushioning materials company to put the local business together and turn it into a major global player in the polyurethane industry. Through the last 50 years, they proved they had excellent foresight in assembling a firm that is very nimble. Today, NCFI, headquartered in Mount Airy, reigns as a leader in the production of polyurethane foam chemical systems for spray foam-in-place insulation, geo-technical, agricultural, roofing, marine flotation, packaging, specialty molding and many other uses. A division of Barnhardt Manufacturing Co., which was founded in 1900, it features lines of polyurethane flexible foams for furniture, seating, transportation seating, bedding, carpet underlay and packaging. The company has plants in Mount Airy; Hickory, N.C.; Dalton, Ga.; and Salt Lake City; with 14 distribution centers spread around the U.S. It employs almost 300. It has grown and expanded regularly during the last five decades. NCFI's last addition came in early 2014 when it purchased a 70,000-sq.-ft. building behind its Mount Airy facility to house a recently purchased gel line, used to produce a gel that's complementary to foam mattresses. 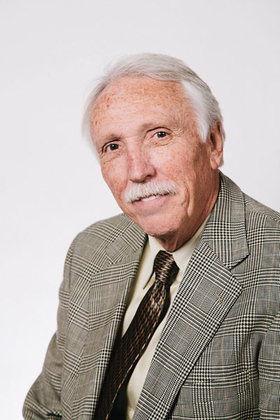 Lewis Barnhardt, president and chief operating officer of NCFI parent Barnhardt Manufacturing. From its inception, NCFI stood out because of its creative leadership team. It began when Mount Airy's Essex Wire, which is now part of Insteel Wire, was getting out of the synthetic foam rubber business in the mid-1960s, according to Lewis Barnhardt, president and chief operating officer of NCFI parent Barnhardt Manufacturing. Harris W. “Ace” Bradley, who had worked on the Manhattan Project during World War II and later with DuPont in discovering and pioneering urethanes in the 1950s, was employed at the soon-to-be-discarded business. “He called Jake Barnhardt with the idea they step in, buy the equipment, rent the facility and rehire the company's employees so they would have a ready-made customer base for the new company they named North Carolina Foam Industries,” Lewis Barnhardt said. Of course, it helped that Barnhardt Manufacturing used the foam, fabricating it for use in its numerous furniture customers' products, and was a key customer of NCFI immediately. It had purchased foam from Essex before it closed its polyurethane foam business, Riddle said. “After we bought the business, it was profitable right out of the gate and in its first year of operation,” Lewis Barnhardt said. “We changed our name to NCFI in 2005 to better reflect our national presence, which is becoming more of an international one,” according to Riddle. Its biggest breakthrough came in 1964 when Bradley perfected NCFI's one-shot production method for foam that allows a continuous production process of simultaneous polymer formation and expansion to form the foam. The one-shot method has become the manufacturing standard in the U.S., the company said. Bradley later was inducted into the Flexible Polyurethane Hall of Fame for his discovery. 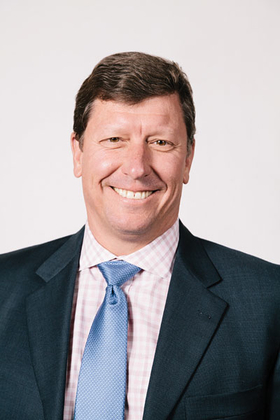 NCFI kept up with the changes in the markets it serves and maintained its growth in those sectors, Lewis Barnhardt said. It also branched out into niche markets and created other markets where urethane foam has not been traditionally used. It currently operates two divisions, Specialty Products and Consumer Products. Specialty Products produces its own Spray Polyurethane Foam insulation that can shield the environment from air infiltration, pollen, dust and noise pollution while saving energy and money, the two executives said. Consumer Products features foams for the furniture, aerospace, marine, medical and carpet padding industries. In addition, the firm manufactures a variety of what it said are money- and energy-saving commercial roofing systems. It claimed that the systems are so tight, they helped protect commercial buildings from damaging winds and driving rains associated with hurricanes Katrina, Andrew and Hugo. NCFI also makes flexible and rigid custom formulated products that can be found in the adhesives, taxidermy and molding industries as well as many other applications. NCFI takes great pride in its numerous accomplishments. He cited the work the company has done with NASA's Space Shuttle program for more than 30 years. “We were chosen in 1980 to supply the foam insulation for Lockheed Martin's External Tank program for the U.S. Space Shuttle program. “Over the many years since, we've had a great relationship with Lockheed and NASA. We've even met some shuttle pilots and crew.” The firm was awarded Lockheed's Supplier Quality Excellence Award in 2010. NCFI also was selected for the Environmental Protection Agency's Stratospheric Ozone Protection Award (now called the Montreal Protocol Award). “We've worked hard to be responsible stewards of the world around us,” Riddle said. 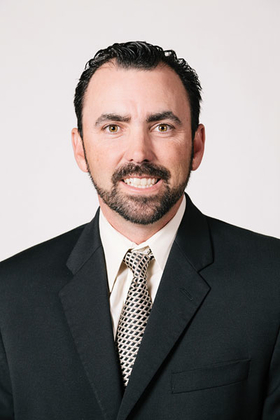 Mitch Clifton, director of business development. Two of the company's biggest growth industries are the construction and home building segments, where energy efficiency has become a top priority. Mitch Clifton, director of business development for NCFI's Specialty Products division, maintained the company's spray foam insulation has become a building standard, and the company has seen “amazing growth in our residential and commercial spray foam insulation market.” The same holds true in the roofing industry, he said. NCFI has seen steady growth in roofing since it did its first job in 1967. Clifton is one of them. His father, Ralph, was among the firm's original 30 employees when NCFI was founded in 1964 and worked for the company for more than 42 years until his retirement. Mitch Clifton followed in his dad's footsteps, working at NCFI on the loading docks while in high school. He received his MBA last year and is now part of the senior management team. The vast experience of the work force is a significant competitive advantage, Clifton said, because spray foam insulation is something customers want. Until recently, it has been a small sector of the insulation market, and few knew much about the technology, he said. Clifton said the company bucks all the trends. “We're a family-owned U.S. company, we make our products here in this country, the people who work here can choose to make a lifetime career with us,” and the firm is willing to change in order to grow. The once local company spans the globe with its reach, Riddle said. After its network gained customers in all corners of the U.S., it branched out to Canada, Mexico and South America in the 1970s, he said. NCFI added Russia in 1993, then spread to Australia, Africa, Eastern Europe and the Middle East.